Plantain herb is used by people since the ancient times. It is found in almost every yard hidden among other herbs, in meadows and forests with no trees. It is not requiring special conditions for growing. It receives the required amount of water from rain. During the dry period, it doesn’t have any special requests for water. They are distinguished by the shape of the leaves. In the leaf of plantain herb are found around 6.5% mucus substance in the form of polysaccharides, tannins, coumarin esculetin, flavonoids (apigenin, luteolin and scutellarein), from the minerals zinc and potassium are found. It contains saponins which act haemolytic and two very important iridoid glycosides aucubin and catalpol. Aucubin has antiviral, detoxifying, anti-inflammatory and antimicrobial effects, and catalpol has anti-hypertensive, antitumor, hepatoprotective, anti-inflammatory and spasmolytic effect. Besides these properties, plantain acts antiseptic, diuretic, bactericidal and bacteriostatic. The remedy which contains plantain is commonly used to treat respiratory diseases, asthma, bronchitis, cough, flu and to perform detoxification of the body. For cold, flu, and respiratory infections – Take the tincture under the tongue or drink freshly brewed warm tea with honey. 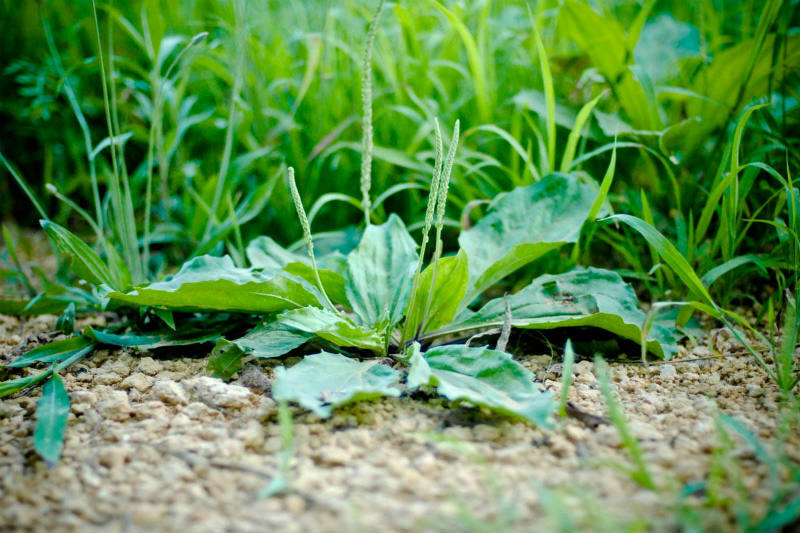 For burns apply a poultice immediately and apply a bandage with plantain leaves. Tea made from plantain leaves is suitable for children because it is tasty, and if necessary, you can sweeten with sugar or honey. It is used for inflammation or ulcers of the stomach or intestines. Also it is useful in diseases of the liver and bladder and against the creation of kidney stones. To stop bleeding from fresh cuts, apply crushed plantain leaves. Wash with plantain tea to prevent infections and promote healing. For throat infection, gargle with plantain tea or diluted tincture. Take 5-10 drops of tincture under the tongue and ingest it slowly. Fresh leaves that have previously been crushed can be used as coatings that are placed on place of insect stings or snake bites.